A Rare Musical Treat Awaits You! Culture and music are two things that can be the best form of entertainment for kids at any point of time. It is entertaining for kids and it gives them a break from their regular schedule. It will not just make your child aware about various genres of music but also give them valuable learning of our rich culture. So how about spending a weekday with kids being a part of Grand Finale 2 of Max Life Insurance i-genius Young Singing Stars? 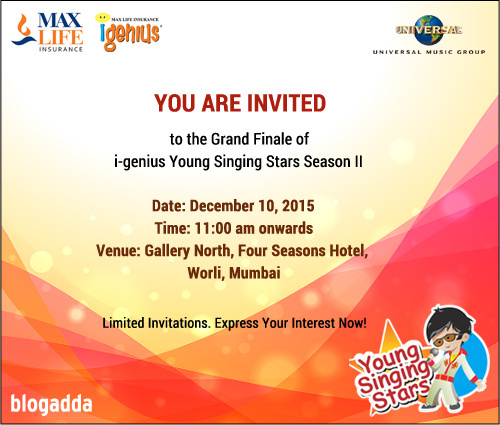 BlogAdda is inviting Mumbai Bloggers to be a part of the Grand Finale 2 of Max Life Insurance i-genius Young Singing Stars. India is abundant with talent when it comes to singing. Time and again this nation has produced talented singers who amaze us with their magical and melodious voice. Once again the hunt for India’s next singing sensation has come to an end, heading for a Finale. The young stars at Max Life Insurance i-genius Young Singing Stars will fight their final battle to win the prestigious ‘Young Singing Star’ title. The judges include the famed Bollywood composer Salim Merchant and Youtube Superstar Shraddha Sharma. Here is your chance to sit back and enjoy the Grand Finale with your kids. Watch the contestants compete with the best of the voices the nation has. Apart from that the bloggers will also get a chance to meet the judges, celebrities and contestants and get to interact with them. The bloggers showing their presence will also be offered special vouchers. Do you need more reasons to say a YES? If you want to be a part of this rare event, then as a blogger following are the things you need to do and they are the simplest of all. Click on the link below to register yourself for a rare musical treat!